Nessie, or Debonaire's Hennessy which was her official name, was born the 29th of October 1975. She was my first Yorkshire Terrier, but not the last. As I for many years had German Shepherds and was active in the Working Dog Club, I am even educated as an instructor, so my intentions was to train Nessie in obedience. The fact that many people at that time regarded it "impossible" to teach a Yorkie obedience, made it an even bigger challenge. Nessie was from the beginning active and interested, and she wanted to learn different things. But it had to be on her conditions! If she only decided that it was fun, she was able to learn almost anything. When Nessie was a little over 10 months old she had her debut in Obedience class 1, and managed to gather enough points for a second price. It was a wonderful feeling to show that even this little dog could carry trough the exercises, in spite of visible skepticism among the public. In those days it was very unusual for small dogs to compete in obedience, except from one or two poodles. But the thing was to get at least 160 points, out of 200 possible, to get a first prize and thereby the possibility to move on to compete in class II. Already at the next competition, in Gutenberg in December the same year, we gathered 162 points and by this a first prize! Guess if we were happy! Because Nessie as a Yorkshire Terrier had a very handy size, we could do a lot of the exercise indoors. Otherwise it would for long periods of the year have been impossible to train her, she would not lay down or sit in pouring rain! I do not care to much for rain and bad weather either. But in our house we had a long straight hall, where we put a non-skid mat. It became a perfect place to train jumps over obstacle, retrieving, come, and other exercises. After some competitions with varying results, we had a total hit in Munkedal April 1978. Nessie was two and a half years old by now and in prime condition. At this competition she didn't only get a first price with 186 points, she also won class II beating lots of German Shepherds and other more usual "obedience breeds". (As if this wasn't enough, my German Shepherd that I also competed with, managed to win class I the same day!) End of story was a photo of Nessie and me in the local newspaper "Bohusläningen". To train obedience is both fun and stimulating for small as well as big dogs. Most Yorkies are very awake and alert and very well suited for obedience training. If they only get the chance, they will quickly learn obedience exercises as well as circus performing. A few yorkies has until now competed in obedience, many with excellent results, but many more should try this. Nessie was the first Yorkie in Sweden to compete in obedience class III. At that time it was from class III the dogs could achieve Obedience Championship. Today we have Elite-class too. Nessie had her debut in class III at a show in Visby, Gotland in 1978. The result was not so good, but even here she got her photo in the local newspaper. A Yorkie is likely to attract attention from the press, because it is still an unusual sight in this sense. Nessie competed several times in class III, with varying results. Everywhere she made attention, many times we met practical problems such as high obstacles and too big retrieving dumb-bells. One had simply not thought that such a little dog could be in the competition! This is why I always brought our own dumb-bell and our own obstacle, just to be sure. They were in use several times and the arranging club was just grateful to lend my stuff. Today I believe this function better and it is more usual with dogs of different breeds and sizes at the competitions. Besides obedience I trained Nessie for Working trails. She really enjoyed tracking, she followed long tracks in the woods or in the open fields and collected items I had set out along the tracks. Also we had search, where the dog is to run free in a wood area marking hidden persons. It was a bit difficult for her in harsh terrain, but she had no problem in using her nose and finding the persons. She could collect a lost glove or the car keys and this was useful to us in "real life" because she was very clever finding things. Besides obedience competitions Nessie also attended several confirmation shows and she had a few litters. One of her puppies became INT NORD CH Footprints Call-me-Son "Timmo". Nessie lived to be almost 15 years old and during her long life she attended many obedience contests. It was one of her greatest pleasures to come along and show her abilities and receive ovations and cheers from the public. At this scene she really enjoyed life. Nessies parents are INT NORD CH Carmardy Benjamin x Blue Elegance. 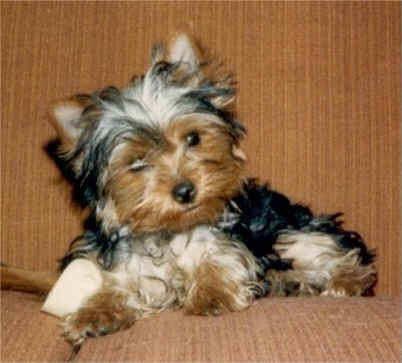 She was bred by Bernice Undén, Debonaire's Yorkshire Terriers.